Love this backstory. A great explanation for the shifter race, and a compelling societal concern regarding the pro-evolution Brotherhood and the more traditional elves. Sets up a lot of dramatic character backstory potential, as well as some great moral quandaries. Awesome. Oh, and also, unrelated to your werewolves specifically, but if you check out Jim Butcher’s fantasy series “The Codex Alera”, there’s an awesomely-written werewolf race that shows up in the 2nd book (well, really they’re just in the wolf-man/crinos form all the time and don’t actually shift) called the Canim who are as ferocious as you want a werewolf to be, but also have a highly developed sense of honor and battle etiquette. Definitely worth a read if you want to be turned on more to wolf-people (and not-at-all in a Twilight kind of way). 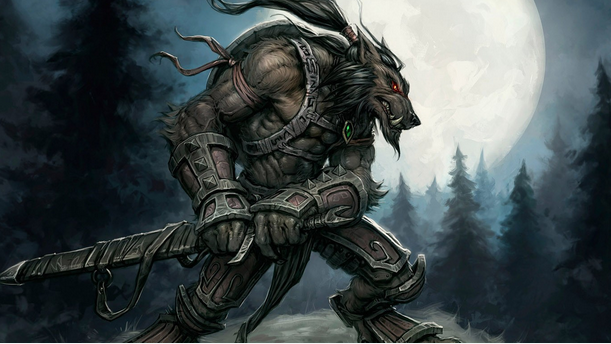 A place where werewolves never really leave their hybrid form and fight with honor and ferocity sounds pretty awesome. I always love to see a spin put on a classic. Thanks for letting me know about the image! I fixed it. Hopefully the caption didn’t give too much away and you’re all shocked now. I’m glad you’re liking the concept here. My hope is as my players read this, they are getting lots of ideas for character backstories and concepts. Are they all werewolves, or other forms of lycanthropy as well? Do they have secret labs where they experiment with new breeds? I’m picturing elven werewolf mages doing research and producing strains of lycanthropy with totally different abilities. * Werecreatures that “hulk out” and grow to size Large opponents with extra strength. * They cannot manage to completely do away with the vulnerability to silver, but maybe they can narrow it to just mithril. As for all the stuff about shifters, no real comment. I like the idea of shifters, but have never really liked them in game. In 3rd ed they were only cool if you sunk a lot of feats into the race at the expense of your class, and in 4th ed they were just underwhelming. No idea what they will be like in Next. Love the Michael Robbins catch up of today! They’ve not said how they are doing lycanthropes yet in fifth, but yes, I do think it should be a bunch of different kinds of lycanthropes. I love the idea of new ones coming into the fold. Plus, weresharks are totally a thing. Google image searching were creatures is terrifying and amusing.